I’m sure you’ve read the media trades where consultants and experts say listeners, viewers and readers want authenticity, they want “real.” The unbelievable claims of being “the best” or “the most” doesn’t cut it with media savvy consumers anymore. But, radio? It just keeps on keeping on, ignoring consumer needs, wants and demands and continues to piss on listeners and call it a gentle spring shower. You probably missed this one because it happened in Baton Rouge, Louisiana and Biloxi, Mississippi, two small cities where people know their neighbors, know the people in their communities and like to see the people they listen to on the radio at their local Albertson’s. Baton Rouge sits over an hour from New Orleans. The Big Easy is known for its Creole culture, Baton Rouge not so much. Overlooking the New Orleans Saints and crawfish, Baton Rouge people are just that, from Baton Rouge – 80 miles to the west – concerned and focused with their area. It’s the state capitol too, so news tends to happens there. The same can be said for Biloxi, home to a lot of sand and numerous casinos. Biloxi is 146 miles from Baton Rouge and 90 miles to the east of New Orleans. Lots of people go there to lay on the beaches, look at the gulf water and its deep blue color and gamble. With plenty of visitors, the locals who live there year round are a pride filled people wanting to keep their culture and heritage alive with media people they trust because those radio personalities also have something at stake in keeping a thriving community going. 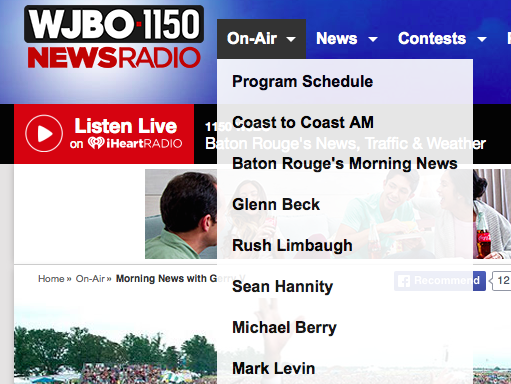 WJBO-AM broadcasts Baton Rouge’s Morning News each weekday morning. WBUV-FM in Biloxi broadcasts Biloxi’s Morning News each weekday morning. This is where the drops of pee start hitting listener’s heads. You’d guess those locally named and branded programs come from those cities. But, you’d be wrong. 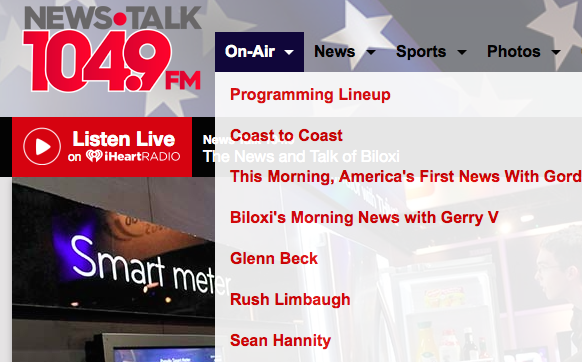 Baton Rouge and Biloxi’s “morning news” come from New Orleans. The same show is actually broadcast on three stations, including WRNO-FM in the Big Easy. The format change? Bob fired Kevin Meeks and Karen Henderson, who were doing Baton Rouge’s Morning News in Baton Rouge, a show name that remains today, just with a new host, a guy named Gerry V who’s in New Orleans. Then, since he was warmed up, Bob gave a copy of the home game to Steve Taylor and Mike Mankiewicz who were on Biloxi’s “Gulf Coast Mornings.” Those two guys can now can get up a little later and listen to Biloxi’s Morning News! The four people who were fired couldn’t have been making more than $200,000 combined. For a company $21 billion in debt, that works out to .00095% of what the banker is owed. So I assume the money was repurposed elsewhere in the company. Little investment or effort is being put into news/talk formats by iHeart Media or any of the big consolidators across the country. The audience continues to age and sales is left selling commercials for nutraceuticals that help the angry old men left listening with their prostate problems so they can pee. Consolidators think the geezers won’t notice their “morning news” is coming from a city over an hour away by car. And besides their hearing is going too. “Murphy,” parroting what he is being told to say and doing his best to stay on his required talking points, says the new show featuring Gerry V. will be more regionally focused, but will have news, weather and traffic teams at each station expand their focus and delve into local news topics of the day. Seriously, who writes this meaningless drivel? Expanded local news, traffic and weather from local people in those cities sounds like a great idea, except both WJBO-AM and WBUV-FM laid off whatever news and traffic departments they had years ago and those so-called information elements also come from places like New Orleans or other regional news and traffic hubs. How do I know this? Let’s just say I “know” someone who was in those meetings. All the stations mentioned are owned by Clear Channel Media + Entertainment iHeart Media, a company not investing much into news/talk stations these days. News/Talk radio has taken an interesting path. At a time when social media has made communication more personal, authentic and has disrupted all traditional media like never before, radio has gone in the other direction, less personal and less relevant. And with decisions like these, the news/talk format in many cities is dying by what the Chinese call “lingchi” – death by a thousand cuts. I’m not against syndicated or networked radio programming and I’m sure Gerry V is a great guy, doing his best to relate to his new cities. I’m just saying be “real” with the listeners. Ooops. 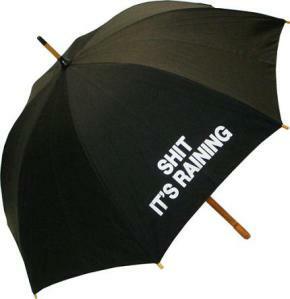 Just felt a few drops. We’d more or less done this for years in Modesto/Stockton, with our news coming from Sacramento and our Traffic from g-d alone knows where. Might have worked, except for the mispronunciation of street names and sports figures names. I love to know too. I find radio station press releases some of the most hilarious and obvious forms of bullsh*t ever written. There must be a class on it at broadcasting school. Mostly written by public relations people. We get it. 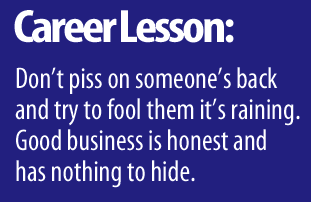 The person got the job because they are to grow ratings and revenue. I guess to PR people that’s deep thought. To those who make a career in broadcasting it’s an obvious understood. Growing up in St. Louis, I remember listening to a prominent FM radio station that made a big deal that they had hired a slick new news reporter with years of experience, Many of us thought it was going to be a local reporter who had recently been let go out of a TV station, but that turned out not to be the case. We were told this individual was “..a St. Louis native” who went to school at a prominent St. Louis college. Instead, it was someone who, after hearing the first report, knew zip about my hometown, Not only did he pronounce local sites and landmarks wrong, but we soon found out that this reporter wasn’t sitting in a St. Louis studio, but was actually in Portland, Maine (!!!). Many of us felt cheated, and there was a huge backlash. Very quickly and without fanfare, the station dropped the reports. 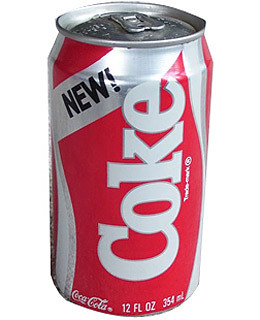 This occurred during the early 1980’s, so obviously this isn’t a new thing.